High speed HDMI cable with ethernet and audio return, supports HDMI version 1.4 and HDMI 2.0 equipment. Supports 720p, 1080i, 1080p, 2160p and UHD 4k x 2k (4096 x 2160). 2.5m HDMI Cable with Ethernet, Audio Return Channel and Swivel Connectors HQ Silver Series Premium HDMI Cable Swivel HDMI connectors Supports HDMI 1.4 and HDMI 2.0 equipment functions; ethernet channel, ethernet via HDMI and audio return channel to send audio back from a display to source. 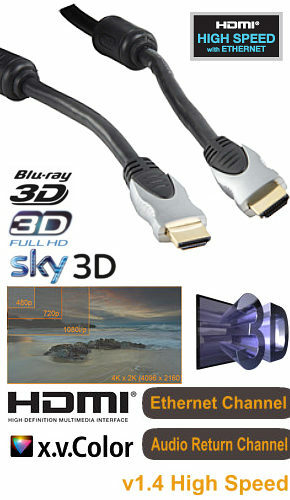 Supports 3D over HDMI, 3DTV, Sky 3D and 3D Blu Ray. Supports 720p, 1080i, 1080p, 2160p and 4k x 2k (4096 x 2160). Supports extended colour spaces eg x.v.colour. 99.99% Pure OFC copper cable. 24k Gold plated 19 pin HDMI A male connectors. Metal shelled swivel connectors provide enhanced shielding and easy installation in tight spaces. Ferrite supressors reduce the risk of interference. Mylar backed foil shielded oxygen free copper twisted pairs for high speed HDMI. Backward compatible with HDMI 1.0, 1.1, 1.2 and 1.3. 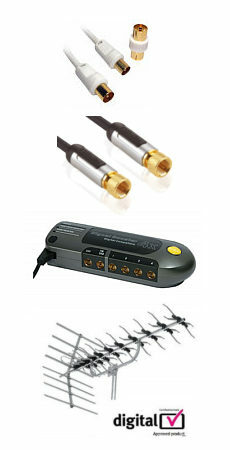 Ideal for connecting 3DTV, Sky 3D, 3D Blu Ray, PS3, XBox 360, Blu Ray DVD, Sky HD, DVD Recorders, Virgin Media HD, Freesat HD etc. Length 2.5 meter.